Through the generosity of the Challinor family, this 587-acre wild area is available to us all for passive recreation. This is not an easy property to navigate (trails are not maintained and the off-trail terrain is rugged), but if you’re comfortable in the woods, you’ll want to explore the Challinor CR. From the center of Tyringham, at the post office: south on Main Road for 2.0 miles to a left (east) on Fenn Road. Follow Fenn for ½ mile till its end at a sign for The Trustees of Reservations. No motorized vehicles beyond this point. From there walk uphill, bearing left on logging roads. 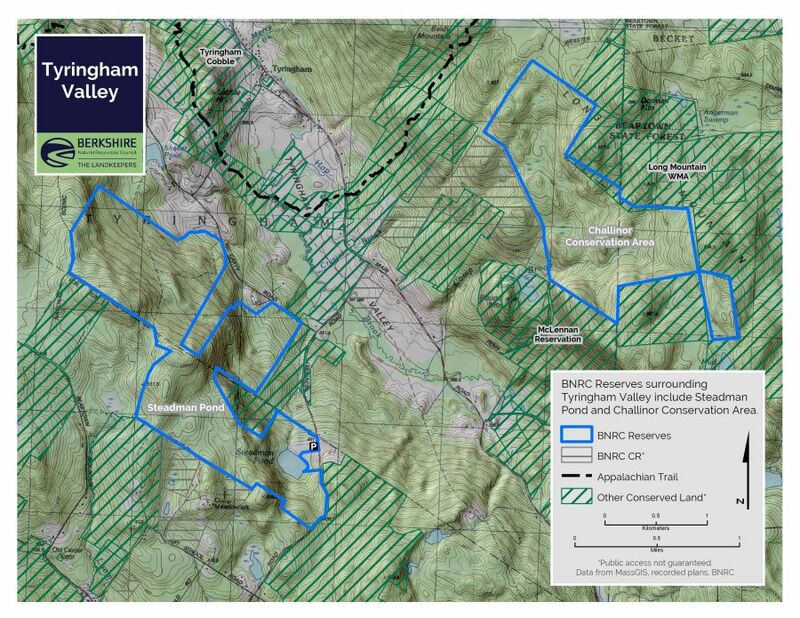 When MassWildlife was seeking a local cost-share for their purchase of the Long Mountain Wildlife Management Area (1,000 acres, east of Challinor), the Challinor family very generously donated to BNRC a perpetual conservation restriction. The CR met the requirements of a local share and now 1,500+ acres of land are permanently conserved for the benefit of wildlife and people! 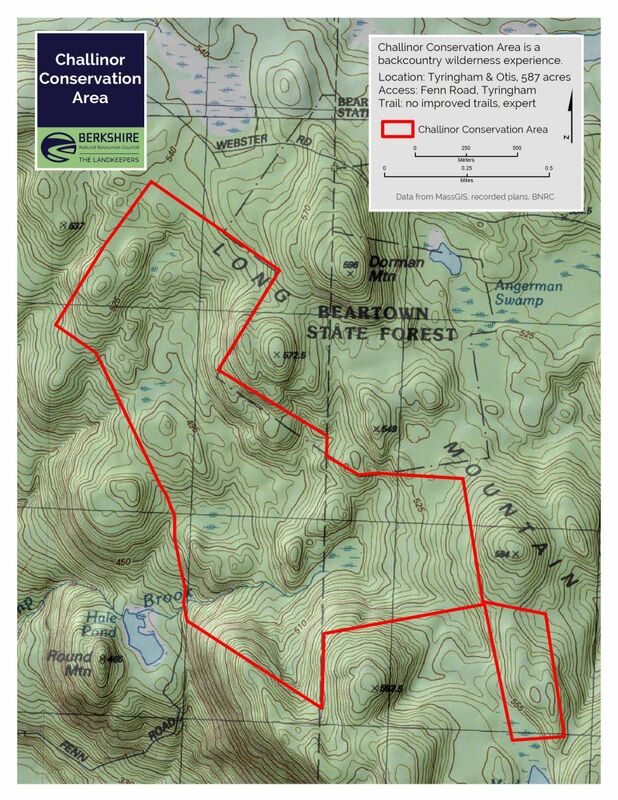 Included in this CR is the affirmative right of the public to visit the Challinor’s land; passive, non-motorized uses are allowed – no ATVs, no snowmobiles, no trucks/jeeps. 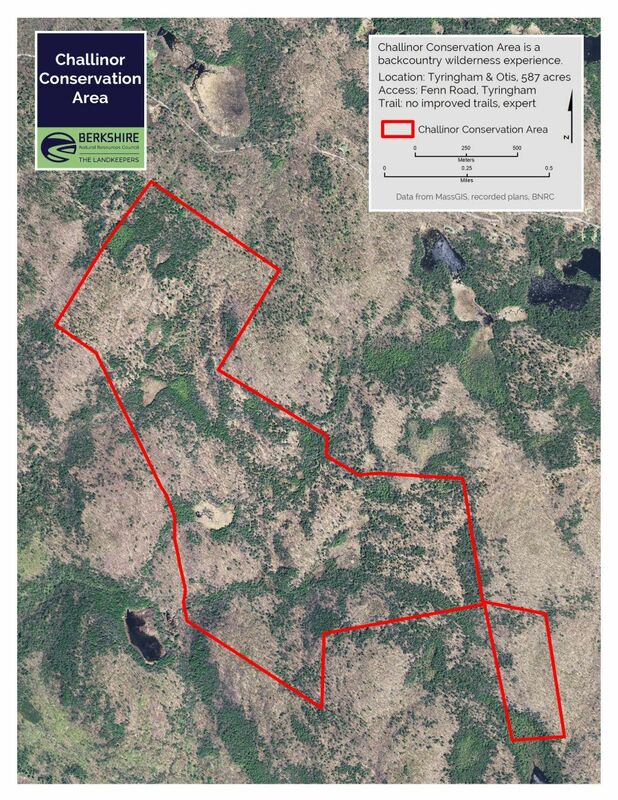 The property has many wood roads and a few navigable skid roads, but the past logging that created such spectacular wildlife habitat also created dense, impassible thickets – there are always trade-offs! If you’re good with a map and compass, go explore. The hills, wetlands, streams, and the rare sense of solitude found here will not disappoint you.